The participants presented the experience of climate-resilient and readily available technologies and practices in water supply, water conservation, alternative energy sources and rational land use. So, along with the drip irrigation system introduced new and unjustly forgotten watering systems, including irrigation of plastic bottles, whose benefits - material availability, ease of fabrication, the minimum work and financial costs, time saved on the watering, significant water savings and the ability of an individual approach to each of greenery. Solar irrigation technology KondensKompressor , the use of which allows to save huge amounts of water for irrigation, and cultivation of plants which need regular watering (can reduce the need for water to 10 times compared with other conventional irrigation systems). In KondensKompressor water is obtained without salts, nitrates and other contaminants. It can also be used for desalination of sea water on a similar principle. Especially when frequent drought, this method can help farmers to increase productivity with fewer resources used. Technology watering clay vessels , are essentially automatic drip irrigation without timers and electronic sensors. The key characteristic is that the water seepage water requirements regulated in the nearby plant. A drop of water is wasted. It is the perfect solution for dry areas. Local irrigation using clay container helps to spend 50-70% less water. Furthermore, disappear weeds, pests becomes smaller, it improves the soil structure and root system of the aerial parts of the plants. The unique opportunity for watering gardens and fallow slopes has presented on display installation, which can operate continuously for months without supervision, control and maintenance, supplying water small village or farm. In terms of fresh and clean water deficiency with sufficient stocks of salt (e.g., sea water) are demonstrated by the application of simple stills, in which the energy source is solar radiation. In CA furnace region for cooking, coal, wood, gaseous or liquid fuels, can be replaced furnaces which utilize solar energy. Temperatures in the solar furnace is sufficient for the preparation of many dishes.Three types of such furnaces were presented at the exhibition. - Parabolic solar cookers, which is useful when you need to quickly prepare a relatively small amount of food that you can make from the satellite dish. - Packaged solar cookers, which are used mainly for relatively slow cooking large amounts of food, which are quite easy to make available materials and exhibits durability up to 10 years. - Derived solar furnace of cardboard, which can be used for finding out (e.g., at grazing, camping and so forth. ), Collected from the template 5 minutes. Using the sun's energy can also greatly facilitate and accelerate the process of drying fruits and vegetables. The structure shown in the exhibition can be used both for domestic use and for the opening of the business. Given the fact that every year the energy prices are constantly rising, could not help think about alternative solutions heating their homes, outbuildings, greenhouses, etc .. This article can reduce the costs, if the additional heating use the free energy from the sun, when aid of a simple device - a solar water heater , which can be made with your own hands. Simple design exhibited on display, able to heat water in a sunny day to 70 degrees. The exhibition also presents the design and technology for rational land use. 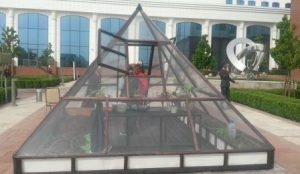 This, for example, economical greenhouse pyramidal structures with unique properties: compactness, hardness, stability, economy, the optimal system natural light, mobility, a special process air. Demonstrated effective and various kinds of organic fertilizer (compost, vermicompost et al.) And biological methods for plant protection. Vermicompost, for example, exceeds the manure and compost humus content 4-8 times. The two-liter bank this fertilizer replaces 50-pound sack of manure. Separately, it was possible to get acquainted with the technology of growing plants without soil (hydroponics). It is expected that the results of the session and the exhibition will identify areas for further cooperation in the field of promotion of climate resilient technologies in the sectors of energy, agriculture and water resources at the local level in the countries of Central Asia.